Helensburgh Primary School has been in the news this week, with the student hosting a group of teachers from the Japanese city of Kawasaki. The visit is part of an exchange with Wollongong’s Sister City, with the teachers visiting primary and public schools across the area, as well as the Uni, to give them first-hand experience of the Australian education system. They spoke with teachers and students at Helensburgh, exchanging ideas. Since November 1987 Wollongong has held a sister city relationship with Kawasaki. This has led to a variety of citizen, sports and cultural exchanges, as well as educational exchanges involving the formation of Sister School and University Agreements. 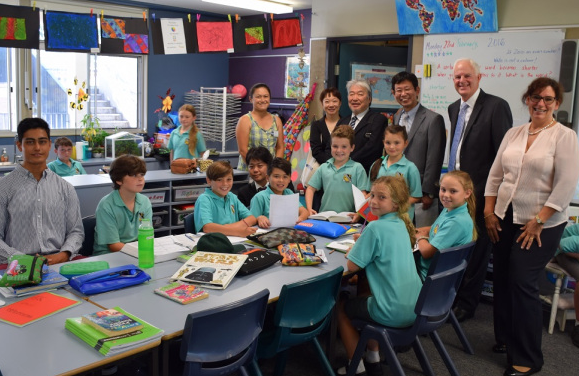 Cr Chris Connor [second from right] with visiting Kawasaki teachers at Helensburgh Public School. Sports Achievement Award winner Kai Sakakibara, a former Helensburgh student, is seated on left. Kai is a NSW BMX rider.